We breathe in and out an average of 24,000 times a day – often without much thought on the matter. Even though the breathing process is automatic we do have the ability to consciously control our breath. In fact, respiration is the only bodily function that we can perform both involuntarily and voluntarily. This unique attribute of breathing makes it a helpful tool for aiding other processes that seem out of our control such as blood pressure, heart rate, and digestion. 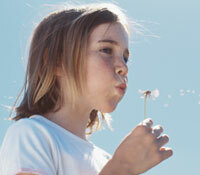 We can in essence speed up or slow down our bodies through the use of our breath. The importance of breath work is emphasized in many ancient healing traditions including Ayurveda, which refers to the breath as pranayama, and incorporates breathing with movement in yoga practices; and Chinese Medicine which emphasizes the importance of breath through Qigong. Likewise, Meditation practices focus on deep breathing, with the breath seen as a gateway to relaxation and inner peace. In addition, given the manner in which optimal breathing sends vital oxygen to the brain and the muscles, breath work plays an important role for increasing energy and improving performance during exercise of all types. Abdominal Breathing – To fully fill our lungs we must breath into our abdomen. We can learn to do this by placing one hand on the chest and the other on the belly and then breathing in deeply aiming to raise the hand on the belly higher than the one on the chest. It may help to practice this technique while lying down. Tonglen – a Buddhist meditative practice in which participants breath in a feeling of dark, heavy and hot, then breath out a feeling of bright cool and light. It is a circular means of letting go. As the breathing advances a personal pain can be added to facilitate releasing it. Healthy.net – Breath Therapy – www.healthy.net/Alternative_Therapy/Breath_Therapy/98 – a variety of articles and techniques on breathing. *Note: this site sells products so some information could be biased. NCCAM – Relaxation for Health – http://nccam.nih.gov/health/stress/relaxation.htm – this article from the National Center for Complementary and Alternative Medicine references breathing exercises as a means for relaxation and explains how they positively impact the body. The Art and Science of Breathing – http://www.drweil.com/drw/u/ART02039/the-art-and-science-of-breathing.html – a variety of breathing exercises from Dr. Andrew Weill. Girman, A., Vigna L., Lee, L. (2004). Chapter 16: Selected Issues in Environmental Medicine in Integrative Medicine. McGraw Hill Companies.